The digital age is transforming the working world but some young people are shunning high-tech careers to follow their ancestors' ancient trades. A thatcher, a blacksmith and a heritage stonemason tell BBC News NI about the appeal of such dying trades. "Don't go into a trade, get an office job. Get into IT, that is where the money is." This was the advice to Shane O'Hare when he was at school - and he took it. The former grammar school student graduated in English and was quickly promoted to a senior role in the hospitality and food sector. But as his 30th birthday loomed last April the County Down man ditched his well-paid job to "take a bit of a gamble" on an ancestor's ancient trade. He is now in the first year of a seven-year apprenticeship as a traditional stonemason. "When I was at school, they wanted people to go into science and technology, STEM (Science Technology Engineering and Mathematics) was a buzz word, while a trade was reserved for someone who was not academic," he said. "I did quite well for myself as a purchaser and worked my way up as far as I could. "It was unusual to break away from what I was doing and it took a while to get the courage to leave." Shane is from Ballymartin at the foot of the Mourne Mountains, where there is a strong tradition of heritage stonemasonry. His great grandfather worked on the famous dry stone walls at Silent Valley reservoir. "Being a stone mason is hard work. It differs drastically from the corporate world. You get cold and wet, a bit more sore at the end of the day," he said. "But there is satisfaction in preserving something that has been there for hundreds of years. Who wouldn't want to be outside getting some Vitamin D?" And the father of two has no regrets about his career change, despite an initial salary cut. "We do not have enough people working to keep up with the demand, there are not enough young people," he said. "The digital world and automisation has its place, but in terms of masonry, you are not going to get a robot that will build a wall. "Traditional stone work has been around for thousands of years - it is timeless. "I used to find it really difficult getting up in the morning - now I bounce out of bed. I can't wait to get started." "There aren't that many traditional blacksmiths left in the country. It is important for me to keep those traditions alive." Danna Herron is only 24, but she relishes the noise, heat and dirt of her work as a blacksmith. Her routine begins when she lights a fire with newspaper and sticks and shovels coal onto the forge, using portable bellows from Belfast shipyard to pump the flames to life. The she chooses a piece of metal and heats it up until it is a "nice yellow colour" before beating it into shape. There is little glamour in the "simple things" Danna makes and repairs "like pokers, hinges, scrolls, wee rings for hanging things on, safety chains for trailers, old gates", but the County Armagh woman could not imagine getting the same satisfaction from any other work. She is following in the footsteps of her late father, David, who served his time as a blacksmith in the 1960s. "I picked it up gradually, watching daddy work. I was fascinated. I think I was about six and said: 'Can I have a go?' I was hardly tall enough to reach the anvil," she said. "You start with a plain piece of metal and you turn it into whatever you want. It is something different, it is important to me. I want to keep the tradition alive." Danna, from Gilford, said she knows few traditional blacksmiths who are "restoring old things, working at machinery". She said young children are often fascinated by her work, which differs from what they are used to in an increasingly high-tech world. "Older trades are still needed. There aren't enough of us [blacksmiths] left. "A young person will get plenty of work, they will not have to fight to get the job like you would in ICT." Danna said she is comfortable about choosing an "old fashioned creative" job rather than "sitting in front of a computer all day". "When I was little I wanted to be a school teacher, but I would always have ended up doing something with my hands", she said. "I am only the link in the chain, people have done this for hundreds of years before me." For James Kilpatrick there is a comforting rhythm to a thatcher's work. Rye and straw rustle as they are sorted into bundles, before being sharply chopped, batted and bent into place. Several generations of his family in County Donegal have been absorbed by the routines of this bronze-age trade, most recently the 26 year old. As a young thatcher, James is a double rarity in today's job market. While his ancient trade is uncommon, James' youth in the trade is rarer still - he is half the age of the few other thatchers he knows. But he is convinced his recent decision to begin a seven-year apprenticeship in the trade is "a safe bet" despite its seeming decline. "It is a craft that is dying out, but I would like to keep it up," he says. "It is nice being in the fresh air and you meet different characters when you are out and about. It would not be for me being inside all the time." 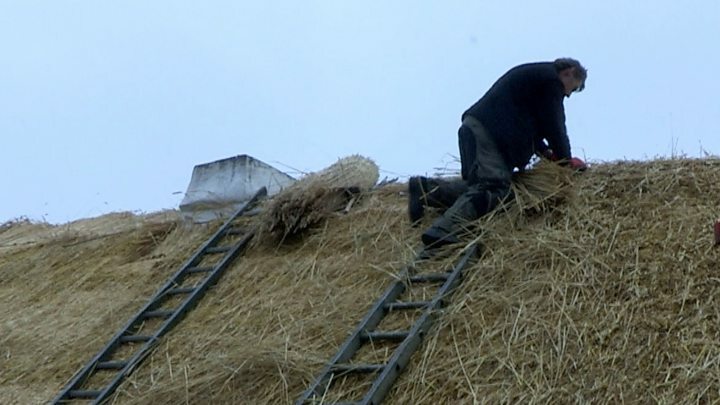 Until recently, James worked on the family farm in Raphoe, which he says is one of a handful that continues to grow the materials for thatching - flax, rye and straw. His grandfather, Billy, trained as a thatcher in the 1970s after struggling to find somebody to repair a roof. At this time, he also converted his 40-acre farm from animals to thatch materials. He says there is growing interest in "the history" of houses, while the satisfaction gained from saving thatched rooves is a great motivator. James' dad, Ivor, 54, said he was delighted his son had recently decided to learn the trade. "I don't know anybody younger than me, other than James, who is giving it a go. There is a living to be made at it, hopefully he will do well," he said. Ivor said he never tired of looking at a new thatch and knowing "that is another building protected and another building saved". "We are losing heritage when people let these places go. Some day there will be very few of them left if we don't catch thatching by the scruff of the neck and keep going," he said. "When you are on a roof there is no noise other than the birds singing. It is the real satisfaction of putting a roof together - the handcraft, the peace and quiet. "I am only doing my piece now and that is the satisfaction - keeping it alive for other people to see."